I have had the privilege of having tasted a significant amount of whiskies and to my surprise; it was only this year that I first wrote a post about Jameson. That post was on their 18 year-old Limited Reserve. 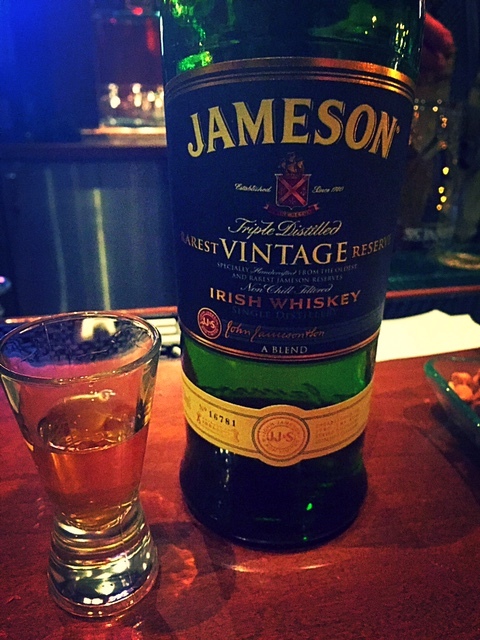 Believe it or not, I am going to top that first Jameson post with what I call, the best Jameson I have to date. Jameson Rarest Vintage Reserve came at the recommendation of Frank from The Last Hurrah and let me tell you, this is AMAZING Irish whiskey! It’s a blended whiskey, crafted only from Jameson’s rare and oldest products, which to me means, you are drinking a blend of awesomeness. To create this product Jameson Masters blend their rare pot still whiskey with their older grain whiskey and then, they age it in second-fill bourbon casks, producing one heck of a product. I always find that whenever I sit down, I never fully sit back on a seat. After taking a sip of this whiskey, before I could even give my thoughts on it, I fully sat back on my seat and enjoyed. Yes, it was that good and yes I would recommend this whiskey to anyone. For non-whiskey drinkers, you may look at the price tag of about $250 and think, this is quite a lot of money, but honestly it really isn’t for the quality and taste of the product. I have tasted whiskies that are around the same price, or higher, that aren’t good at all. Jameson masterfully married the perfect whiskies together, creating a complex but perfectly balance product. Yes, I do wish I knew what those rare and old whiskies used were, but in the end I am just happy to know that such a product exists. It is a product that is beautifully made and I definitely look to eventually add to my collection. PS: I will be traveling to Europe soon and would love to get some recommendation on a couple of whiskies currently not sold in the US to bring back with me. If you have any recommendations, I would love to hear them.